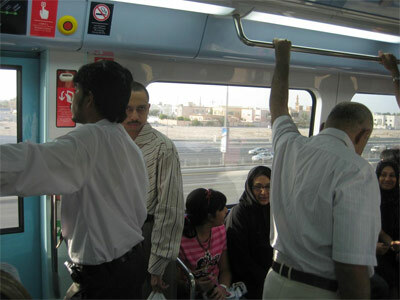 The new Dubai Metro rail system recently began operations in the desert city. Christopher Corbett, an American planner who's been living and working in Dubai, takes us on a visual tour. 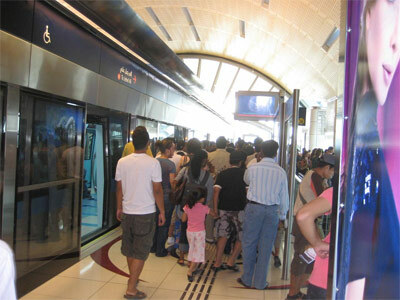 A new, automated rail system has begun operations in Dubai. 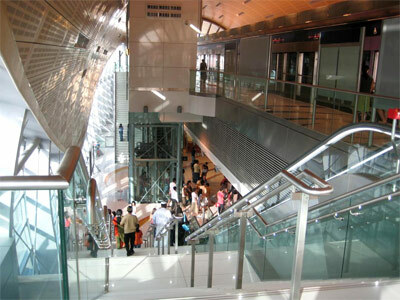 The Red Line of the Dubai Metro is the first to open, with about 47 kilometers of track and 10 stations in operation. Each station is about a kilometer-and-a-half apart, and more stations are expected to open in the coming months for the Red Line and a separate Green Line. 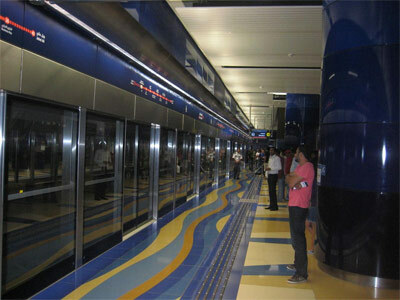 Below are some photos of the Dubai Metro taken Saturday, 12 September, the second day of operation. The weekend for most here is Friday plus Saturday for some. Both are big shopping days at the malls. Ten Metro stations on the Red Line were in business on the Friday opening day, with 19 others scheduled to open during the next few months as construction work is completed. 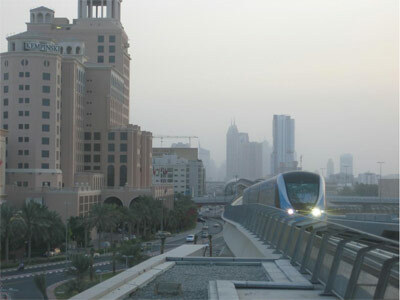 An in-bound train arriving at the Mall of the Emirates station. 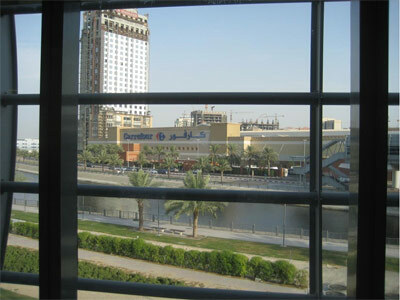 The attached photos were taken at two stations: Khalid Bin Al-Waleed, a ten-minute walk from my apartment, and at Mall of the Emirates station. Also included are some photos taken inside the trains and of various sights along the way from the elevated tracks. Khalid Bin Al-Waleed Station (locally-known as Bank Street) is the first underground station going in-bound toward Deira (central Dubai). 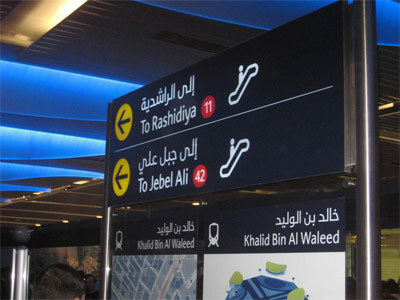 Outbound from Khalid Bin Al-Waleed, the line emerges from the ground and remains elevated the remaining 38-kilometers to its southern terminus at Jebel Ali. 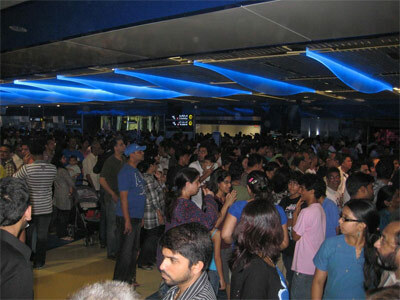 The opening day crowd at Khalid Bin Al-Waleed station. Opening day (Friday) was like going to a rock concert. Khalid Bin Al-Waleed station was jam-packed so I ventured in only far enough to take some photos of the opening day crowd. The following afternoon, I headed back and bought my rechargeable plastic card with 50 Dirhams credit (about $14), enough for ten-roundtrip fares within the central fare zone (which includes most places I would ordinarily go to, including my office and Terminal 3 at DXB). The trains were crowded, but had no problem getting a standing spot next to a door so that I could take some photos along the way. One of the open stations is at Mall of the Emirates (the one with the ski run), located 18-km south from Khalid Bin Al-Waleed. I rarely went to the Mall of the Emirates because of the traffic, plus once there, it could take twenty minutes to get parked in the gargantuan, but ever-crowded parking garage; plus another twenty minutes to get out of the place. Getting there by the Metro took just 15 minutes, though admittedly, the train just slowed down a bit while passing through a half-dozen unfinished stations, so the trip will probably take another ten minutes when all stations are operational. The exit stairway at the Mall of the Emirates station. The Metro station at Mall of the Emirates is off to a busy start. It looks like about half of the riders got off here yesterday, passing through the tubular airport-like passageways (complete with moving walkways) directly into the mall. Inexperience was clearly in evidence as hundreds of riders were trying to go in and out of the same turnstiles, with security personnel not up to the job of sorting things out. The three operational turnstiles were simply not enough for the hundreds of people trying to push through in either direction; it looks like the design consultants didn't get it quite right, though fortunately the station has space enough for more turnstiles. The trains run by the clock, leaving every seven minutes whether they are full or not. I think this has something to do with their being driverless, unlike manually-controlled subway trains in New York, where trains don't leave the station until every last body squeezes through the doors. 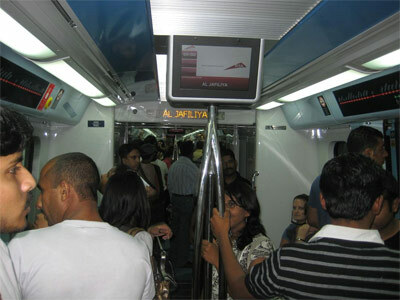 In fact, compared to New York, the Dubai Metro crowds were downright civil, even jovial, perhaps this being the latest new thing in Dubai. It will be interesting to see if that mood lasts, especially considering the reckless, anything-but-civil, driving on the roads, which is why I can't wait for the Green Line to open next March, so I can ride the Metro to work. A directional sign in the Metro station. 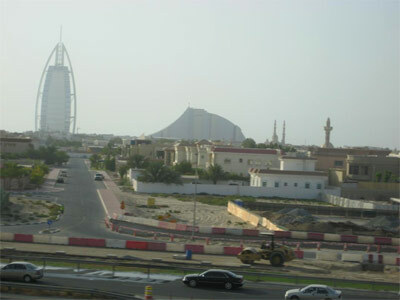 Rashidiya is the northern terminus and Jebel Ali is at the southern end. On the subway platform at Khalid Bin Al-Waleed, with automated doors that lead to the driverless trains. 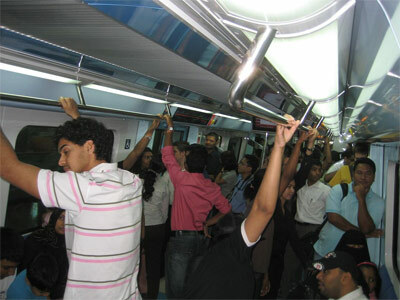 Inside the train at Al-Jafiliya (a major shopping street). 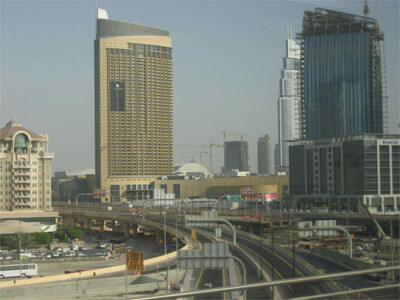 A view of the Dubai Mall from the elevated tracks. Inside a crowded southbound train. Passing traffic on Sheikh Zayed Road. Disembarking at the Mall of the Emirates station. 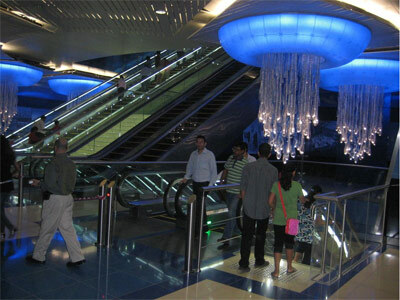 A view from the pedestrian passageway at Mall of the Emirates station. 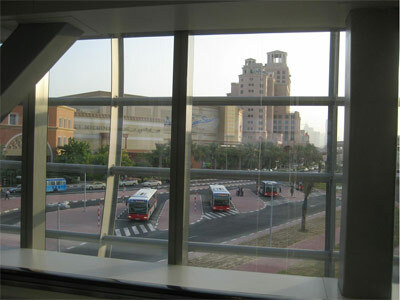 The Metro Connector Bus Terminal at the Mall of Emirates. Inside the Khalid Bin Al-Waleed station. Christopher Corbett is Senior Master Planner and Acting Head of Master Planning for AECOM's Dubai office. This is the fourth time he's worked in the Middle East. He was previously with the Planning Department in the Ministry of Municipal Affairs in Doha-Qatar 1995-1998; then with CH2M-Hill in Dubai 1998-2000; and then with GHD (an Australian engineering consultancy) in Doha-Qatar during 2002-2003. During 2005-06, he worked for CDM in Louisiana on FEMA-sponsored post-Katrina community recovery planning and during 2007 for same in Greensburg-KS following destruction of the town by a May 2007 tornado. He has a Master's of Urban Planning from the Univ. of Washington in Seattle. His current USA home is San Francisco.